Copland's - Rodeo Suite mvt 4 "Hoe Down"
Bizet's - Carmen Suite "Aragonaise" and 5 "Les Toreador"
BUT WAIT...limited time discounted tickets available at bit.ly/EarwormsTO. The 2018 AIDS Walk Ventura takes place Saturday, March 3rd at Plaza Park in Ventura. Check-in and entertainment starts:at 8:30am and walk starts at 10am. AIDS Walk Ventura is a fun, healthy way for friends, families and teams of co-workers to raise awareness and help to do their part in the fight against HIV & AIDS in Ventura County. Learn more and sign up at aidswalkventura.org. Make-A-Wish® Tri-Counties will be hosting its 9th Annual Wish Night gala celebrating the power of a wish to inspire hope, strength and joy to courageous children battling life-threatening medical conditions. This year’s event will be held 5:30-10 p.m. on February 23, 2018 at the Hyatt Regency in Westlake Village. A special program highlight is the opportunity for guests to personally help make wishes come true through Fund-A-Wish. The evening also features heartfelt wish stories, a plated dinner, a wine wall, live music and silent and live auctions. Make-A-Wish® Tri-Counties has granted over 1,500 wishes for local children throughout Ventura, Santa Barbara and San Luis Obispo Counties since 1985. . For tickets and/or sponsorship information, visit tri-counties.wish.org. Embark on an adventure with My Father’s Dragon at the Bank of America Thousand Oaks Civic Arts Plaza, Fred Kavli Theatre, Saturday, January 20, 2018 at 2:00 p.m.
Based on Ruth Stiles Gannett’s beloved, award-winning and best-selling Dragon trilogy, Enchantment Theatre Company’s My Father’s Dragon features talking animals, flying dragons and buried treasure! Elmer sets off on a daring adventure to rescue a baby dragon being held captive by the ferocious animals of Wild Island. With pluck and ingenuity Elmer makes his way to the island, outwits the wild animals and saves Boris, the dragon. But can they find their way back home? 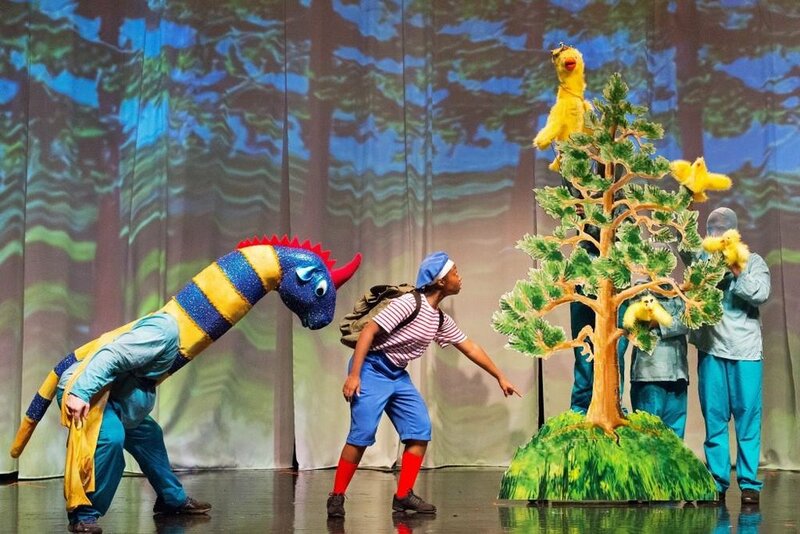 Using life-size puppets, expressive masks, magical scenic effects and original music, Enchantment brings to life this remarkable tale that reminds us all that we are never too young to make a difference. The Enchantment Theatre Company awakens imaginations of every age with its whimsical telling of new and classic fables, myths and legends. For this production, they bring to vivid life a story that has been honored by Newbery and the American Library Association, named among the top 100 books for children by the School Library Journal, and is celebrating its 70th anniversary of publication in 2018. With “delightfully logical nonsense, appealing characters, and irrepressible humor,” (the New York Times), the production is a tale of derring-do and laughter, too. Single tickets are priced at $29-$19 with group discounts available. Tickets are available from Ticketmaster at 800-745-3000, online at www.ticketmaster.com (or more specifically, THIS LINK) or through the Thousand Oaks Civic Arts Plaza Box Office, located at 2100 Thousand Oaks Boulevard. For more information call 805-449-ARTS (2787) or visit www.civicartsplaza.com. Celebrate the biodiversity and abundance of animals living in Marine Protected Areas. Dive into the world of marine science with our interactive activities and ocean-themed crafts. Underwater Parks Day at Santa Barbara Museum of Natural History Sea Center on Stearns Wharf. 10am to 3pm on Saturday, January 20, 2018. The 2019 Arroyo Creek Half Marathon, 5K and 10K are planned for Sunday, June 2nd at Rancho Simi Community Park, 1765 Royal Ave, Simi Valley. Run along the tree-lined Arroyo Creek bike path through the center of Simi Valley. Half marathon starts at 7am. Aid stations every 1.5 miles.